Trader Joe’s is coming to Kansas City! When I heard the news, I did the Happy Dance…twice. You see, we are getting two. One on the Kansas side and one on the Missouri side. This news was the talk of the town last Friday. It was the topic at the Mister’s work. Those who have never experienced a Trader Joe’s were even talking about it. 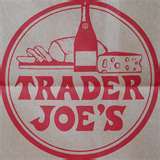 Those who did not know what a Trader Joe’s was, now know. In this day of travel with less baggage and the contents under constant scrutiny, bringing home Trader Joe’s has never been harder. Twenty years ago, I used to load up tote bags with two buck Chuck, jars of salsa, and bottles of dressing. All stowed down by my feet. Today we can’t do that. Anything I wanted to bring home had to go in my already stuffed, one and only suitcase. The suitcase I paid twenty five dollars to ride in the belly of the plane. I usually did not get much. Family members coming to visit have always asked what they could bring me from TJ’s. Family members here in town would travel to cities with a TJ’s and they always asked what they could bring back home for me. I have the absolute BEST family. To make it easier for family to bring me treats from TJ’s, I asked for small items. The best vanilla in the world, bottles of spices, noodles, dried fruit, and artichoke pesto. This entry was posted in Trader Joe's. Bookmark the permalink. One Response to Trader Joe’s is coming to Kansas City! Oh, Nella I seriously wish one would come to FLorida!! Like to Winter Springs, FL! Lucky, lucky you!